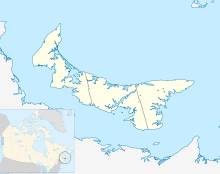 Belfast is a municipality that holds community status in Prince Edward Island, Canada. It is located in southeastern Queens County in the townships of Lot 57 and Lot 58. Situated on the island's south shore along the Northumberland Strait, Belfast is predominantly an agricultural area. Belfast was the landing site of Lord Selkirk's settlers in 1803. These poor displaced Scottish farmers soon established themselves on the best land in the area and it became one of the most productive farming districts in the colony. The Presbyterian Scots were joined in the mid-19th century by displaced Irish potato famine refugees who were forced to take poorer land in surrounding areas. Political, social and economic tensions between the Roman Catholic Irish and Presbyterian Scots boiled over during a general election in March 1847, resulting in what has become known as the Belfast Riot. Today, Belfast is known for its golf course Belfast Highland Greens, Mini Woolen Mills, and many art studios and pottery shops. Also of interest is the lighthouse at nearby Point Prim, which was designed by Architect Isaac Smith in 1845(notable for designing Province House (Prince Edward Island))  and is the oldest lighthouse on the Island. The 18.2 m (60 foot) structure is also the only round brick lighthouse on PEI and one of the last of its kind in Canada. Of particular note is the local parish church, St. John's. Built in 1824 in the style of Sir Christopher Wren, Saint John's is today under the pastoral care of Rev. Roger W.MacPhee. In 2005, the church invited Robin Mark, a popular Christian musician from Belfast, Northern Ireland, to lead their "Emerging Church Conference." The E.C.C. was such a success that Mr. Mark returned in 2006 for "Revival in Belfast II" and was scheduled to be back in 2007 along with Pastor Paul Reid. Saint John's has the largest Presbyterian Sunday school east of Montreal. In addition to Saint John's, Belfast is home to two other churches, namely, Saint Michael's Roman Catholic, and Wood Islands Presbyterian. Many residents of the community attend worship services in Charlottetown or Montague. Belfasts major recreational component to their community include, Belfast Rec Center which includes one ice surface, a community room, a canteen & a skate sharpening service; Belfast Highland Greens, a 9-hole golf course Belfast Community Pool which includes two outdoor pools, a kiddy pool and canteen services, as well as a softball field beside the rink. Belfast is also home to a community-operated campground at Lord Selkirk Provincial Park. One of the region's major employers is Northumberland Ferries, which operates a terminal in Wood Islands. This ferry service, which connects Prince Edward Island to Caribou, Nova Scotia, was first established in 1941. Two ferryboats, the M.V.Confederation and MV Holiday Island, currently service the route. Students in the area attend Belfast Consolidated School. From grade 10 through grade 12, they attend Montague Regional High School. Both schools are administered by P.E.I. 's English Language School Board. Notable "Belfasters" include former P.E.I. premier John Angus MacLean (d. 2000). Dr. Angus MacAulay, b. 10 Dec. 1759, a lay preacher and medical doctor, was instrumental in helping to establish the first church (a log structure) in 1804. Macaulay was thus easily elected to the House of Assembly in 1806 as a representative of Queens County. When Lieutenant Governor Smith called for elections to a new assembly in 1818, Macaulay was returned from Queens County, and was an active speaker of the house government. Elected again in 1820, Macaulay was once more chosen speaker when the house convened in July. Macaulay stood by his people publicly and privately for more than a quarter of a century. He gave a plot of his own land in Point Prim for a cemetery (where he buried his own daughter). The Polly Cemetery is still used by locals today in the community of Belfast. d. 6 Dec. 1827. Dougald MacKinnon (December 15, 1886 – August 21, 1970) was a farmer, fisherman and political figure on Prince Edward Island. He represented 4th Queens in the Legislative Assembly of Prince Edward Island from 1935 to 1959 as a Liberal. He was known for repeatedly working for his constituent. As a people person he was well regarded in the community of Belfast. He served in the province's Executive Council. His portfolio included Minister of Public Works and Highways, Minister of Industry and Natural Resources and was the first Minister of Fisheries for the Province of PEI. He was also involved in the local Belfast Historical Society and served as President of The St Andrew's Society. The members of the band Paper Lions come from Belfast. ^ Canada, Parks Canada Agency, Government of. "Parks Canada - Province House National Historic Site - A Legislature for Prince Edward Island". www.pc.gc.ca. Retrieved 2016-10-28. ^ "Lighthouses of Prince Edward Island, Beacons of Light". virtualmuseum.ca. Retrieved 2016-10-28. ^ "St. John's Presbyterian Church | Home | Welcome to St. John's". www.belfastchurch.ca. Retrieved 2016-10-28. ^ "Lord Selkirk park leased out to community group". CBC News. Retrieved 2016-10-28. This page was last edited on 22 April 2019, at 01:06 (UTC).